By now, the “S” series iPhone follows a predictable pattern: it retains the same design as its predecessor, but debuts a new flagship feature that, over time, trickles down (or up) to the rest of Apple’s hardware lineup. 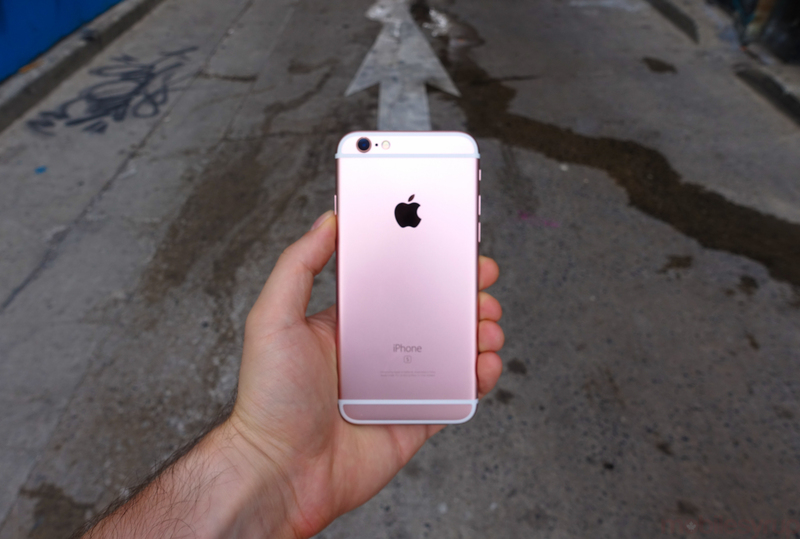 This year the new iPhones, the 6s and 6s Plus, debut two of those features. Without them, they would be outstanding phones, awash in hardware improvements and a base level of polish that exceeds every handset manufacturer on the planet. With them, they move the devices even further away from the specs race that envelops Android, focusing on core user experiences. Much of this review was performed using a 128GB rose gold iPhone 6s running a version of iOS 9 that was slightly newer than the GM version but not quite as new as the one that shipped on September 16th to existing devices. 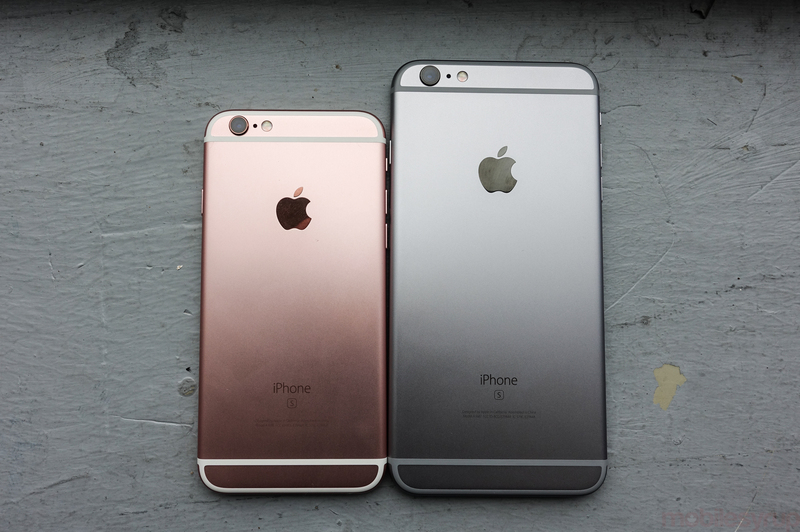 References made to the iPhone 6s Plus are from using a 128GB Space Grey model. 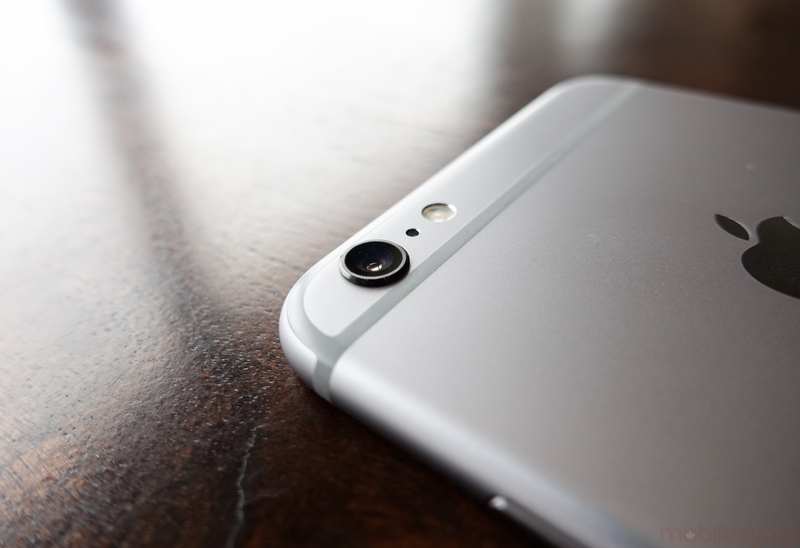 All camera and video samples were taken with the iPhone 6s unless otherwise specified. 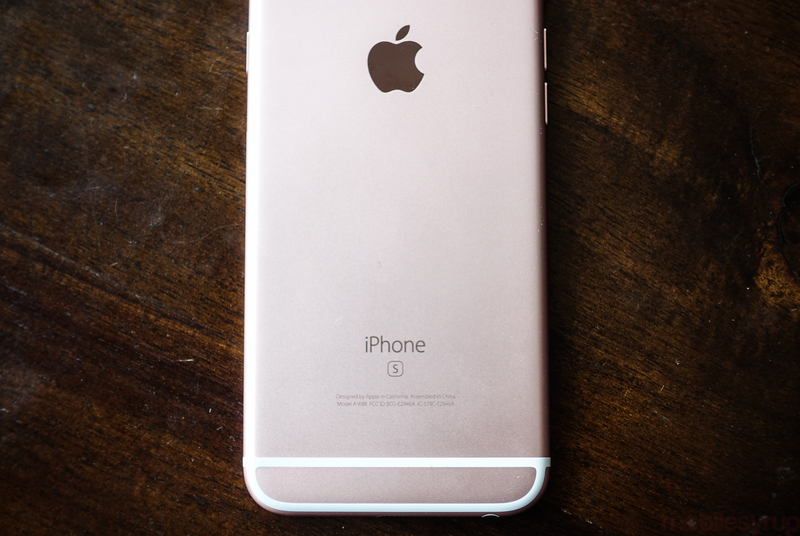 A follow-up review of the iPhone 6s Plus is forthcoming. Photos of the phones themselves were taken with a Nikon D750 provided by Nikon Canada. 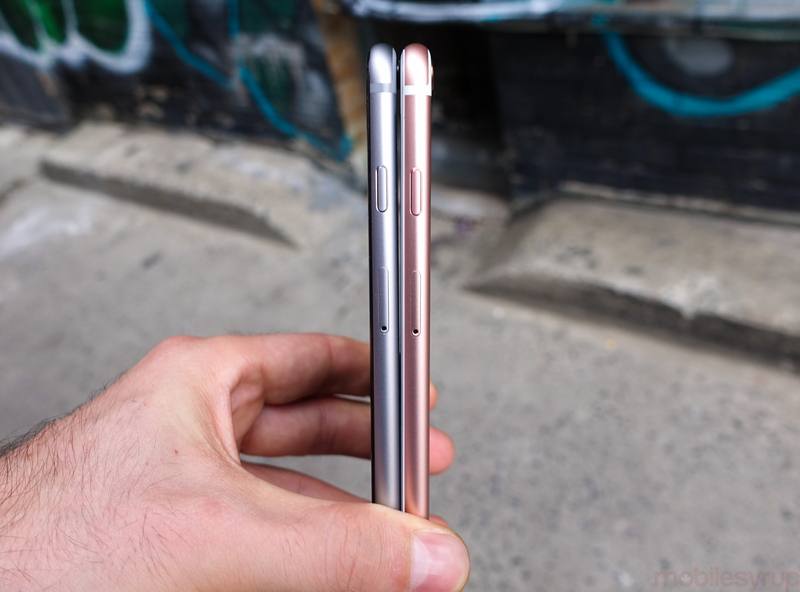 There isn’t a lot of external difference to the two iPhone 6s models this year, though Apple has been clear that a lot of work went into making the similar-looking aluminum alloy significantly more robust. Not only is the material stronger and less prone to bending, but it appears to be reinforced against scratches, too. So too is the hardier glass substrate, of Apple’s own concoction (unlike most Android and Windows Phone devices, which use Corning’s Gorilla Glass). An unfortunate situation a few days into my time with the iPhone 6s caused it to come into contact with cement. Though it was in a leather case that absorbed most of the impact (and was worse for the wear as a result), the screen and exposed metal areas were completely unscathed. The company claims that both new phones are stronger and less prone to scratching, thanks to the combination of a new 7000 series aluminum — similar to the Apple Watch Sport — and hardier screen, kilned in the fires of Mount Doom created with what Apple calls a “special dual ion‑exchange process”. This is a good thing, because the iPhones are slippery, the larger 5.5-inch 6s Plus especially so, given its size and added weight. The added weight, imperceptible on the iPhone 6s but noticeable on the 6s Plus, comes from the addition of a pressure-sensitive layer below the glass that, coupled with a new Taptic Engine, enables Apple’s marquee feature, 3D Touch. These are the first iPhones that actually gain weight and thickness from their predecessors, increasing from 6.9 millimetres thickness and 129 grams on the iPhone 6 to 7.1 millimetres and 142 grams on the iPhone 6s. 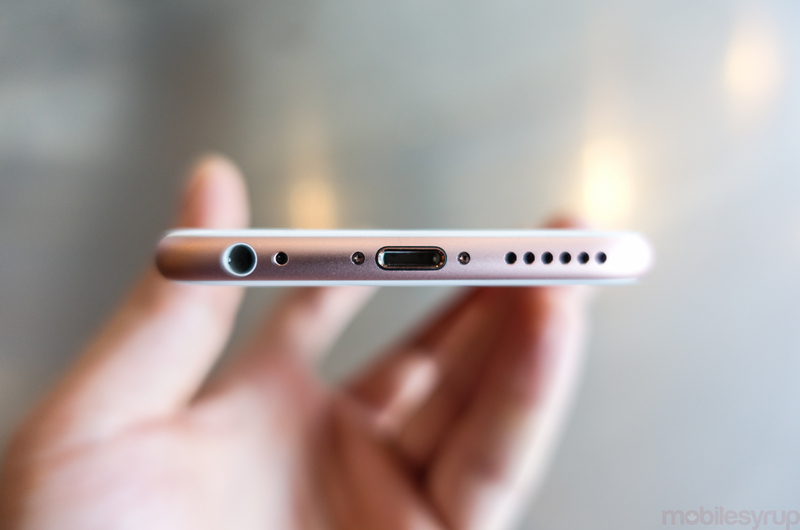 The 6s Plus gains even more, from 172 grams to 192 grams, while increasing in thickness 0.2mm to 7.3 millimetres. While there is precedent to this move — the iPad 3 gained weight and girth over the iPad 2 when it was released in early 2012 — it’s clear that Apple feels the compromise is justified. 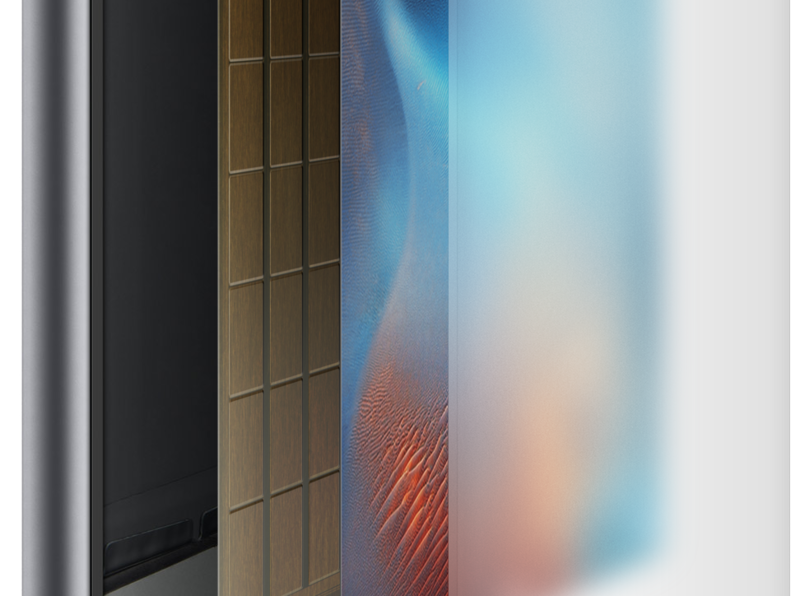 The panels themselves appear unchanged from last year, which continues to separate the devices, especially the smaller iPhone 6s, from their Android counterparts, when it comes to display density. Apple’s decision to keep its most popular device relatively small and comparatively low-resolution affects only those subjectively put out by the decision. I have never thought, even when directly compared to denser phones like Samsung’s Galaxy line, that Apple made the wrong decision to stick with 720p on the smaller model. And while it’s possible we’ll see a resolution increase next year — the A9 chip inside the phone is clearly capable of pushing more pixels than the iPhone 6s’s 1336 x 750 resolution — any arguments for an increase come down to what is sacrificed. I’m fine with Apple’s argument that 326 pixels per inch equates with ‘Retina’; others may not be, which, if they want an iPhone, will lead them to the 401 ppi iPhone 6s Plus. 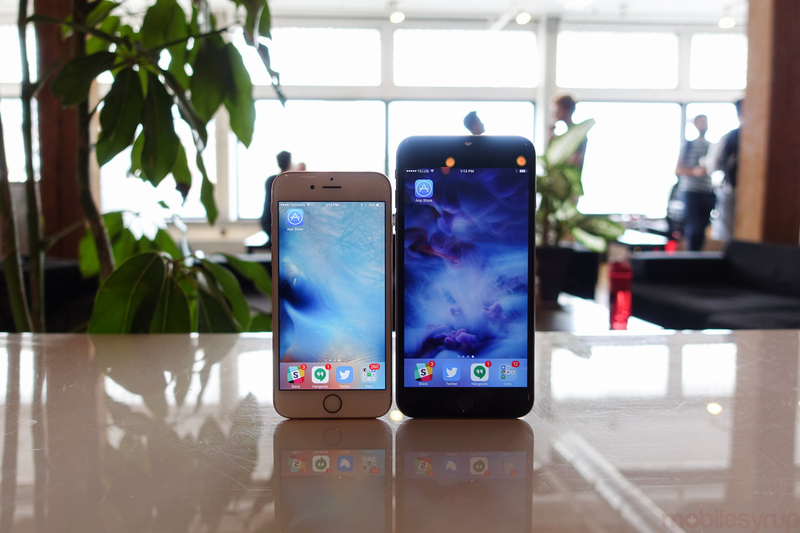 I still find the iPhone 6s Plus too big for my taste, but its battery life and sharper screen make up for it. As someone who likes using his phone in one hand, the 6s Plus is just too tall; there’s an argument that the iPhone’s home button, now that 3D Touch can be used to activate the multitasking menu, is not long for this world — Apple owns a patent related to the integration of Touch ID into display glass — which could significantly shorten the height of the next-gen Plus, but there are millions of people who love the phone’s size. At least it’s well balanced. 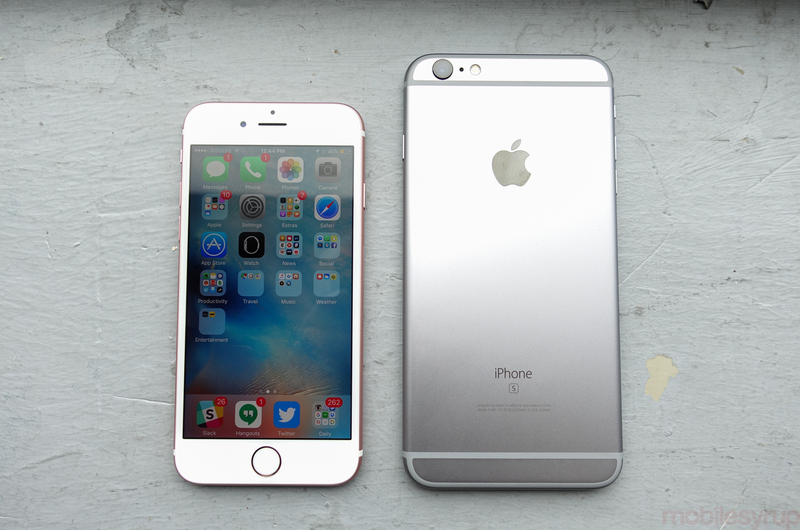 The iPhone 6s, on the other hand, is the right size. 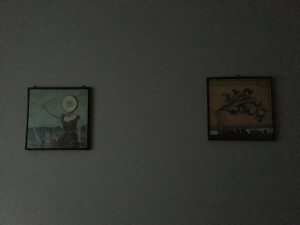 It’s well-weighted and feels deliberate in its balance. It’s also going to be the right phone for most people. In addition to the existing Space Grey, silver and gold variants, Apple has debuted a comely new rose gold iPhone that, after spending some time with, is very desirable. Whether the colour will stay trendy in the long term remains to be seen, but Apple hasn’t sacrificed any of its manufacturing prowess in the move to stronger aluminum. I’d like to see a thinning of the antenna lines around the phones, particularly on the silver, gold and rose gold models, but there isn’t much else I would criticize about the iPhone’s aesthetic. Apple ships its new A9 chip inside three devices this quarter: the iPhone 6s, iPhone 6s Plus and, in a more powerful variant, the iPad Pro. As it does every year, the company promises improved computing performance — in this case, 70 to 80 percent range over last year’s A8, and somewhere closer to 90 percent on the graphics side. While we’ll have to wait for the semiconductor experts to weigh in on the physical differences in this year’s chip, we have some compelling evidence that the A9 is more than just a higher-clocked A8. 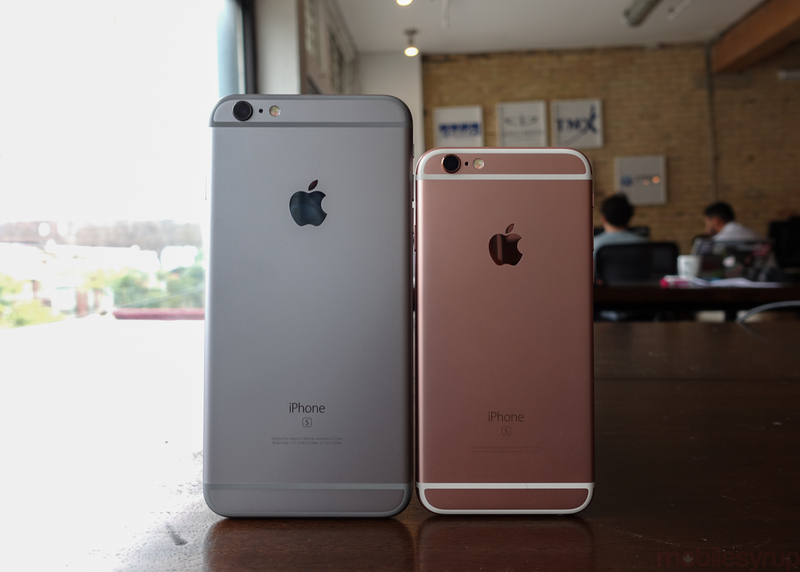 The A9 is clocked at 1.85Ghz on both the iPhone 6s and 6s Plus, a 32 percent speed bump over the A8. 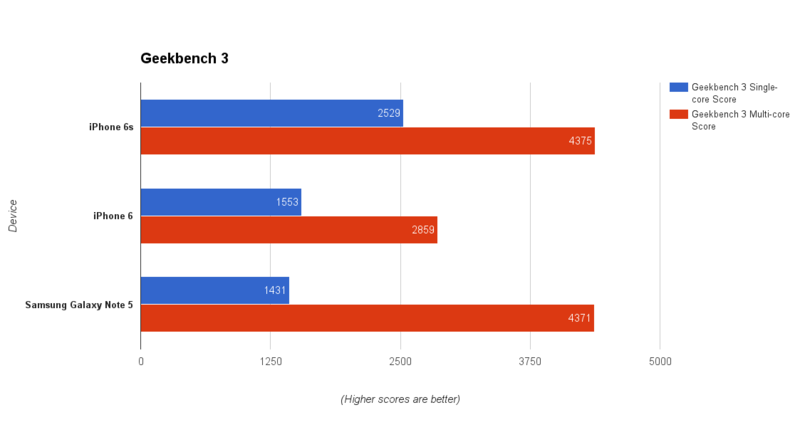 If the A9 was merely a higher-clocked A8 — both are dual-core parts — then we’d expect synthetic benchmarks to scale linearly. But instead we get a 63 percent increase in single-core performance in CPU-based Geekbench 3, and a 53 percent boost in multi-core performance. Most impressive is that the dual-core A9 bests the octa-core Exynos 7420 inside Samsung’s latest devices, arguably the fastest chips currently available in the Android ecosystem, in multi-core performance. 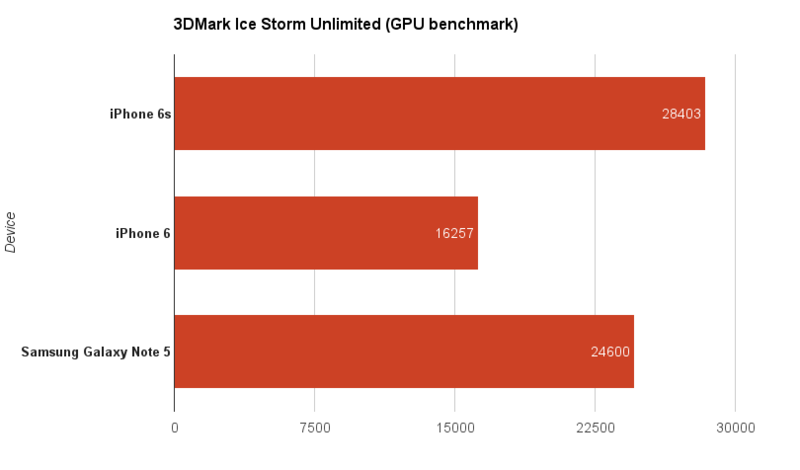 On the GPU side, Apple’s claim of a 90 percent bump in performance over the A8 isn’t quite accurate, but the 75 percent bump I saw in 3DMark Unlimited bumps it above the Note 5’s GPU, one of the most powerful currently on the market. 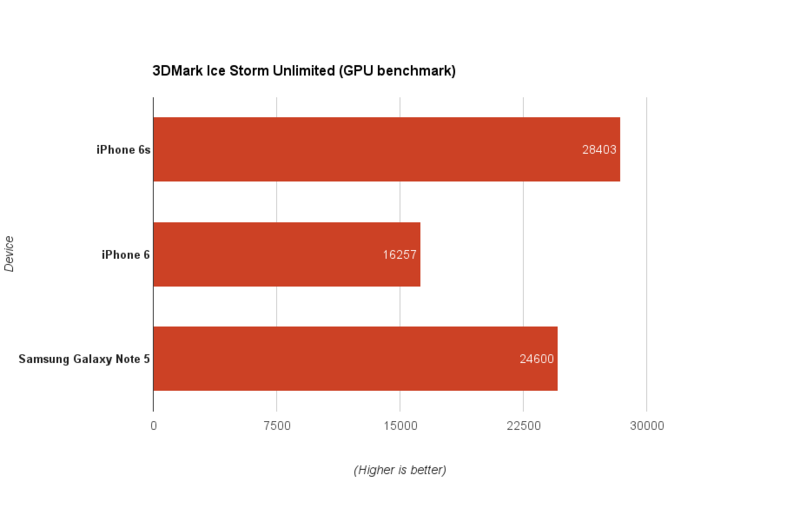 The reason I bring up benchmarks is because Apple’s A-series chips are often dismissed outright by the Android faithful for their rather conservative clock speeds and core counts; the company has maintained a dual-core CPU setup since the iPhone 4s’ A5. But Apple’s custom designs have yielded some of the most efficient processors on the market, and the year over year upgrades are astounding, especially since there doesn’t seem to be a de facto need for the performance gains. It’s clear after using the iPhone 6s and 6s Plus and comparing it their predecessors, they are considerably faster when meandering around the operating system. While that subjective speed bump is somewhat attributable to the clock gains in the A9, much of it is due to the bump in RAM. That’s right, the new iPhones have 2GB of RAM. It’s unclear why Apple waited until 2015 to give its flagship devices what appears to be a standard amount of memory in the Android ecosystem, but it wasn’t until using the iPhone 6 Plus that it became apparent a single gigabyte was a system bottleneck. This year, both devices spend far less time refreshing browser tabs and reloading apps from hibernation, and when combined with 3D Touch’s new multitasking gesture (which I will gush about in the next section), iOS 9 feels like a completely different operating system on the new phones. iOS 9 is iteration in its purest form. It’s about adding intelligence to a mobile operating system that has heretofore been mostly static. It’s about filling in the gaps, in places such as Apple Maps, and Notes, and in the frameworks, by allowing things like universal links, Spotlight Search, content blockers and Safari View Controller. The single biggest change to iOS 9, however, comes in the form of a hardware-enabled feature, and one that Apple hopes will convince both existing iPhone users and those on other platforms that the iPhone 6s and 6s Plus are the devices to buy this year. We’ve seen it on the Apple Watch and various MacBooks in the form of Force Touch, but 3D Touch is its more mature sibling. With a layer of pressure-sensitive capacitive sensors under the LCD, the new iPhones can detect subtle changes in force, which convey to the system that instead of a simple tap — the typical input of a smartphone — the user wants to do something else. That “something else” is where iOS 9 comes in, and where Apple has really differentiated itself from the rest of the industry in the way it fuses the development of hardware and software. Two new system-wide actions, “Peek” and “Pop” combine with home screen Quick Actions to create a second and third layer of interaction. Of course a call needs a response, so Apple has integrated a larger version of the Taptic Engine first seen in the Apple Watch to replace the linear oscillating engine in the iPhone 6. ‘Taptic’ may be a marketing term, but there is reason to be tremendously excited about its proliferation into Apple’s products. Not only does it let users tangibly distinguish between the new iPhone’s various 3D Touch gestures, but it dramatically improves the entire notification experience across the iPhone itself. Coupled with the new chronological conveyance of the Notification Center, the iPhone 6s is a far more capable device for those of us, like me, who receive hundreds of notifications per day. But back to Quick Actions, Peek and Pop. On the home screen, a regular tap still launches an app — that hasn’t, and likely will never change — but pressing a bit harder on supported icons reveals Quick Actions. While many of Apple’s own apps already support Quick Actions — the camera app has shortcuts to take a selfie, or quickly record video, for instance — the first wave of third-party apps have already been updated with native 3D Touch support. Shazam, for instance, lets you quickly begin capturing audio for identification, and there are likely hundreds more apps to come. Even though Quick Actions only save a tap or two, they add up over time. More important to the schema are Peek and Pop, activated within supported apps by a light press and a subsequent harder one. These two levels perform what, by definition, they are trained to do: preview content in a contained window overlaid on top of the existing app — in Mail, for example, a peek into the actual email from the inbox — and then, if content with the content, a jump into the next layer. 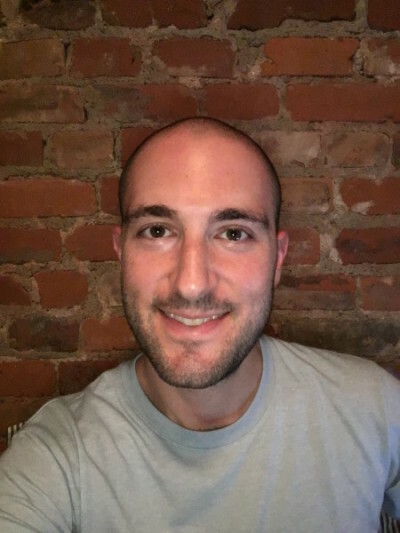 The best use cases for Peek and Pop right now come from the Mail and Messages apps, but they will soon be fleshed out by any piece of software laden with links to somewhere else on the device. A web link within an iMessage can be previewed without leaving Messages; a swipe up within the Peek window reveals commands such as “Open Link” or “Add to Reading List”, for example. In other apps, swiping left or right within a Peek window reveals shortcuts; in Mail, the defaults are “Mark Unread” and “Archive”, but these can be altered. 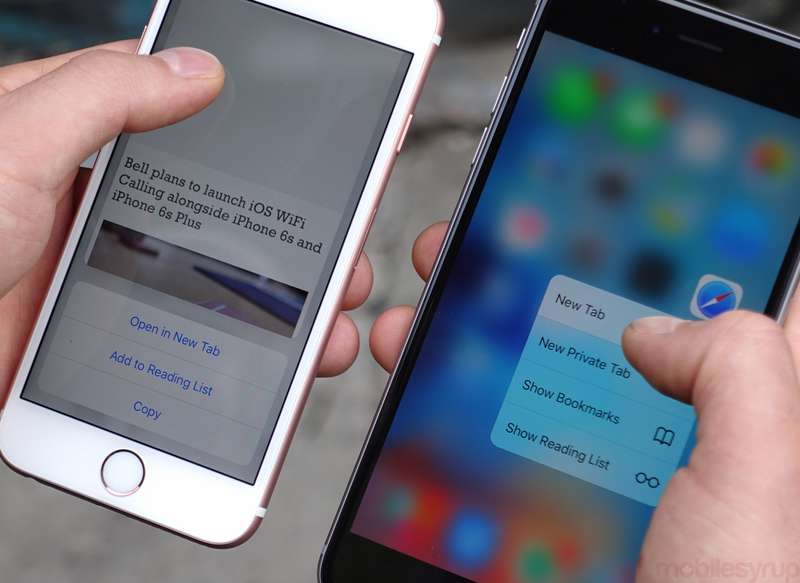 What’s notable about 3D Touch isn’t necessarily the individual commands currently available. As with many of its new features Apple merely leads by example, but the API is much more extensible (or will be in subsequent updates). 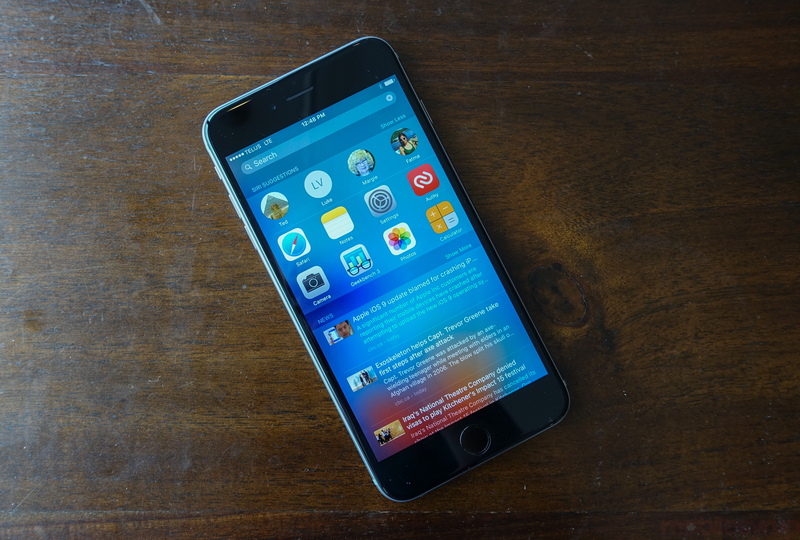 Game developers, for instance, can use 3D Touch to program shortcuts or alternative commands. Note-taking apps could use the equivalent of a Peek to quickly add formatting to text. Drawing apps can use the pressure-sensitive screen to allow users to draw lines with more precision. There’s no question that 3D Touch adds a degree of complexity to iOS, an operating system that by necessity has year over year has become more akin to its desktop counterpart. But Apple’s self-imposed limits force itself and developers to creatively work within the constraints of a single-window paradigm. 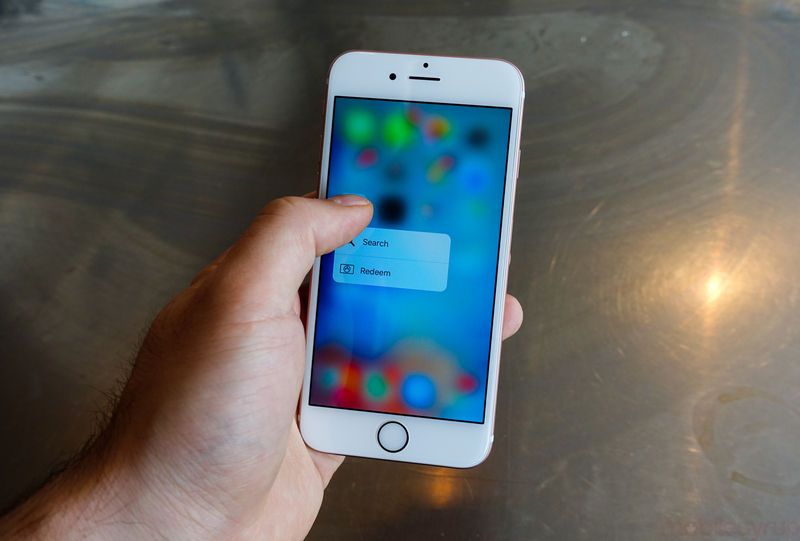 3D Touch may not change the way people use their phones overnight, and there will be those who choose to ignore its presence on the iPhone 6s. But like Siri and Touch ID were when they were announced — not coincidentally also in ‘S’ years — 3D Touch lays a foundation on which both Apple and its millions of developers can build a new set of app experiences. And to some extent it frees the home screen from the home button, and the apps from their windows. Imagine a scenario where all you want to do is send your significant other a pre-defined message saying, “I’ll be home soon.” At some point it will be possible to 3D Touch on an app icon, move your finger a few pixels south and complete the intention without ever having lifted your finger from the screen. Indeed, two of my favourite implementations of 3D Touch right now are both subtle and incredibly powerful. As iOS 7 taught its users to swipe right from the left side of the display to return to the previous layer, apps built like cards on top of one another, the iPhone 6s and iOS 9 will teach us to seamlessly swipe between apps using that same gesture — just applied with a bit of force. It takes some getting used to, since the system will occasionally misinterpret a 3D Touch swipe for a regular one, but in my two weeks with the new iPhones I learned to harness the power of the multitasking gesture to get a lot more done. In lieu of actual dual-pane multitasking on the iPhone, referencing information between two apps became as simple as Force Swiping back and forth between two apps. 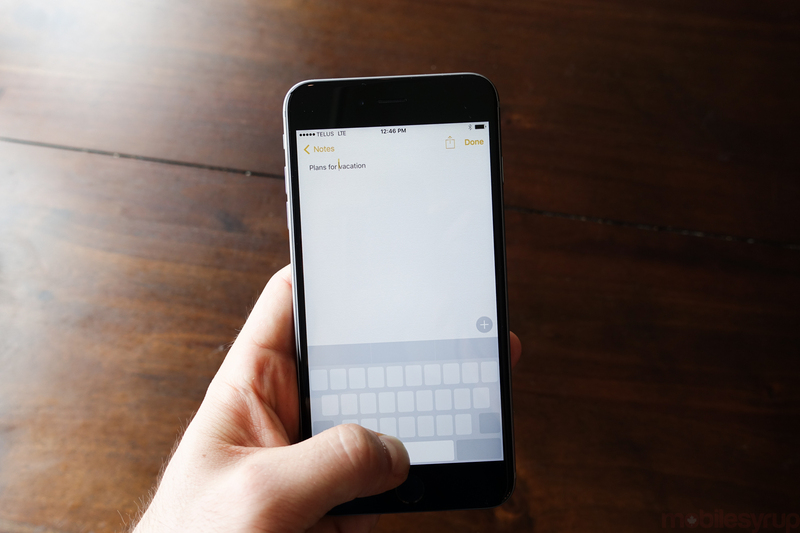 Lastly, Apple has added the ability to quickly scan between text using a 3D Touch press on the keyboard, alleviating the three step process of hold-swipe-tap for text selection. After pressing down on any key for a moment, the keyboard letters disappear, making the entire surface into a trackpad. Languishing on a word for a moment will highlight it, allowing you to increase or decrease the selection by dragging the cursor around the screen. It doesn’t always work as intended — Apple badly needs to tweak the sensitivity for word selection — but the idea is sound. 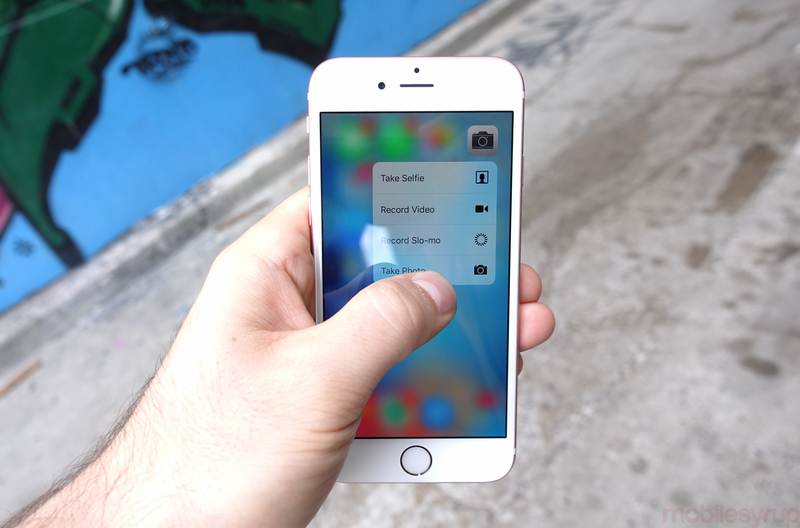 3D Touch is but one aspect of an iOS that is both heavier and lighter than it was last year. Small changes, such as moving to San Francisco as a system font, helps breath some life into a design that, two years on, has aged very well. Adding a dedicated Siri search bar to the left side of the home screen negates the need to talk to Siri all the time; everything from equations to web searches can now be performed in one place. iOS always felt fast, but outside of the apps that enabled its intelligence it rarely felt smart. Now you can do far more independent of the apps that, on iOS, one always took for granted to be there to get things done. If you want to ask Siri to play music, or just that one song, you can; if you want to get quick transit directions home, all you need to do is open Spotlight and type the words. A lot of doubters dismiss iOS because it doesn’t look like it’s busy, praising Android because it wears its complexity in the open. iOS 9 can do the same and more, it just hides the seams better. That changed earlier this year with the launch of the Galaxy S6, which managed to best Apple’s then-flagship, the iPhone 6, in a couple of important areas: spatial detail, and speed. But it became apparent that those two tenets were only small parts of a much more cohesive whole, and today the iPhone maintains its pedigree as the best camera for most people, most of the time. Still, Apple’s photo engineering team likely wasn’t content to let Android abscond with its advantages, so with the iPhone 6s and 6s Plus it has increased the number of pixels by 50 percent, to 12 megapixels, while increasing the speed at which the camera app loads and takes its first photo. The new iPhones also capture 4K video at 30 frames per second, while increasing the base 1080p resolution to 60 frames per second, an increasingly popular rate supported by popular streaming services like YouTube and Vimeo. Apple’s video stabilization is still industry-leading, well beyond anything employed by Samsung and its ilk. Judder is practically non-existent while shooting video, and even the plain 6s’s digital stabilization makes it difficult to tell when the subject is walking. The larger iPhone 6s Plus is still alone with its optical image stabilization, for reasons Apple won’t divulge, but this year the company has enabled the feature for video capture as well. While adding 4K video capture was anything but necessary, the results are wondrous to behold. Colours pop, focus is smooth, and frames are constant. 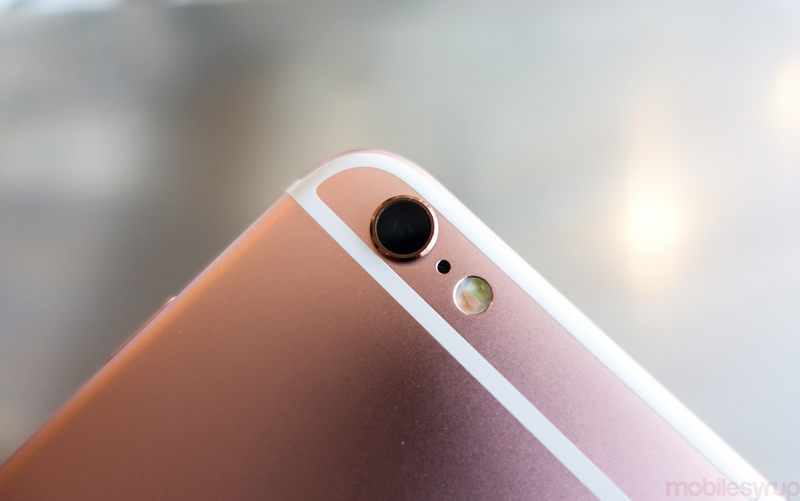 Both the iPhone 6s and 6s Plus have received massive upgrades in their front-facing cameras, too. Keeping up with the rest of the industry, and with its customers’ increasing tendency to capture selfies, they both have five megapixel sensors with F2.2 lenses. But the biggest change may be the implementation of what Apple calls a Retina flash, where the camera senses the ambient light and, as the physical LED does with the rear lens, uses the Retina display to alight the subject’s face. Given its simplicity, the Retina flash works surprisingly well in lower-light situations, and alleviates the pressure in finding a well-lit area to take a selfie with friends or family. There are a bunch of things Apple hasn’t changed, though. The phones still have the same five-element F2.2 lens, and the sensors are still a sensible 4:3 aspect ratio. A 50 percent bump in pixels doesn’t necessarily increase the quality of photos, and Apple hasn’t messed with a good thing in that regard. Daytime photos are lush and beautifully captured, but are most importantly accurate, with near-perfect white balance and a tendency to capture the warmth of a scene, along with an appropriate depth of field. Many of the photos speak for themselves, finding the right balance in every metric: exposure, noise reduction, shutter speed, light sensitivity, and focus. But Apple did regress in one area: low-light performance. Because the 12 megapixel sensor in the new iPhones is roughly the same size as the 8 megapixel sensor in the previous versions, the pixels themselves are smaller (1.22 microns versus 1.5 microns). And despite reduced cross-talk between them, which purportedly lowers noise levels in low-light shots, it’s evident when comparing photos of the previous generation to this one that both of the newer models, the iPhone 6s especially, has to compensate by ratcheting up the light sensitivity, allowing grain and noise to creep in. 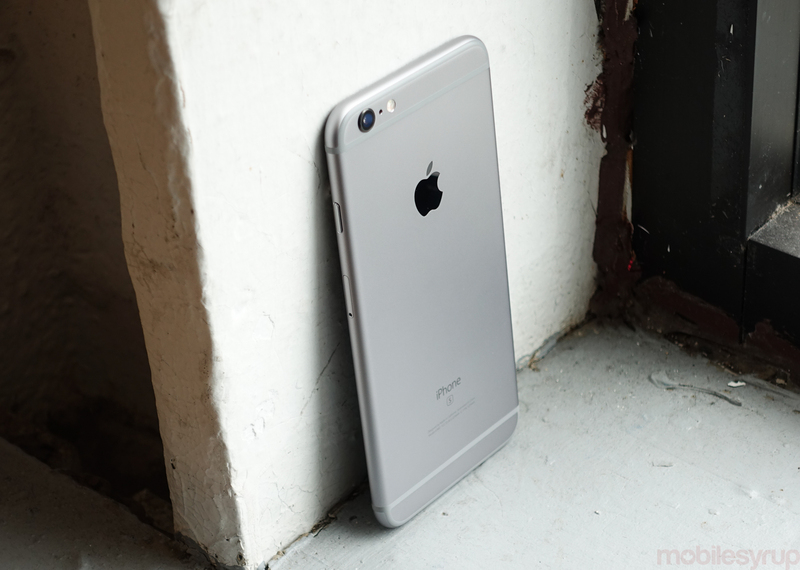 The differences are subtle, but it’s clear that the iPhone 6 Plus captures the best photo. Its optical image stabilization allows the shutter to stay open a quarter of a second, the same length as the iPhone 6s Plus, but the newer phone ramps up the light sensitivity to compensate for the reduced light available to its pixels, increasing the grain. The same thing can be seen between the iPhone 6 and iPhone 6s, though arguably the 6s takes a cleaner photo due to the improved noise handling through the A9’s updated image signal processor. Apple has improved the new iPhones’ cameras in nearly every way over last year, and the single regression detailed above is minor, not because it is insignificant but because most smartphones similarly struggle to capture photos in low light. iPhones have never been leaders in this area because Apple compromises on the size of its sensors, understanding that to enlarge the sensor would be to thicken the phone itself. The move to 12 megapixels on the back, five megapixels on the front, and 4K video capture are all milestones worth noting, but the takeaway from my time with the iPhone 6s and its optically stabilized kin, the 6s Plus, is that they take incredible photos most of the time. Let’s talk about feelings for a second, because many times in the course of reviewing a phone, the methodical pragmatism of how it functions overrides the feelings it evokes. 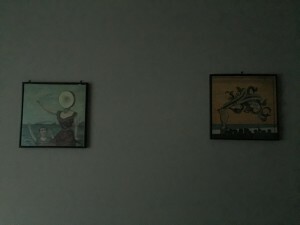 The feelings extracted from Live Photos, Apple’s photographic pièce de résistance, took me by surprise. I was at my aunt’s house for dinner, and my three year-old cousin was running around, a natural centre of attention. 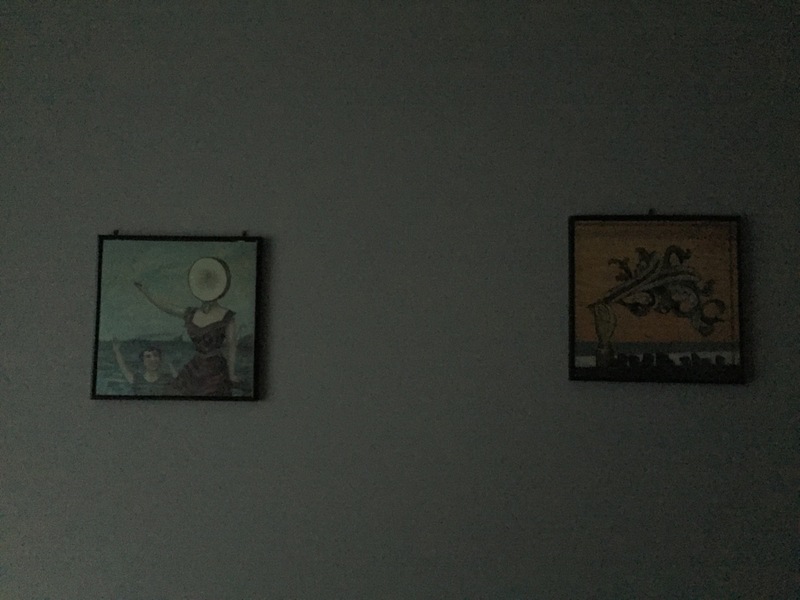 I took a photo of her as she was laughing, but Apple’s “Live” banner appeared just above her head as the shutter depressed. Suddenly, there was a photo, but there was also this moment of her giggling, one that previously I would have had to use the video feature to get. Instead, by tapping down on that static photo I got to see her move and hear her laugh. Live Photos is a small feature with enormous implications for how iPhone users, and the online photography community in general, capture images. And while no one would argue that the idea is original — variations on the theme have been propagated by HTC and Nokia — Apple’s ability, and tendency, to invariably alter the way people use technology, will make Live Photos into a platform. At the moment, sharing Live Photos from the iPhone is not particularly easy, since they are enclosed within Apple’s ecosystem of iMessage, iCloud Photo Library and AirDrop, and only viewable on devices running iOS 9, OS X El Capitan, or watchOS 2. But the iOS 9 developer tools contain a Live Photos API, and it won’t be long until we see support from big messaging platforms like Facebook, Instagram, Pinterest, WhatsApp, Kik, WeChat and more. Live Photos are both extensions of, and separate from, the photos one takes with his or her phone. 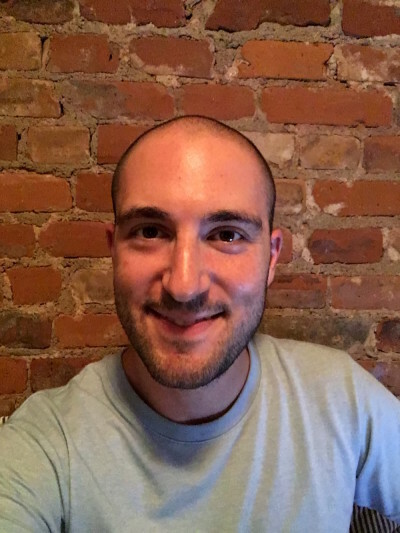 The feature can be toggled within the Camera app, and while any editing will remove the video portion, iCloud Photo Library saves the original. And in the interest of compatibility, when exporting a Live Photo from a Mac, it emerges as a still JPEG and a 15fps video file, useful for sharing outside of Apple’s ecosystem. 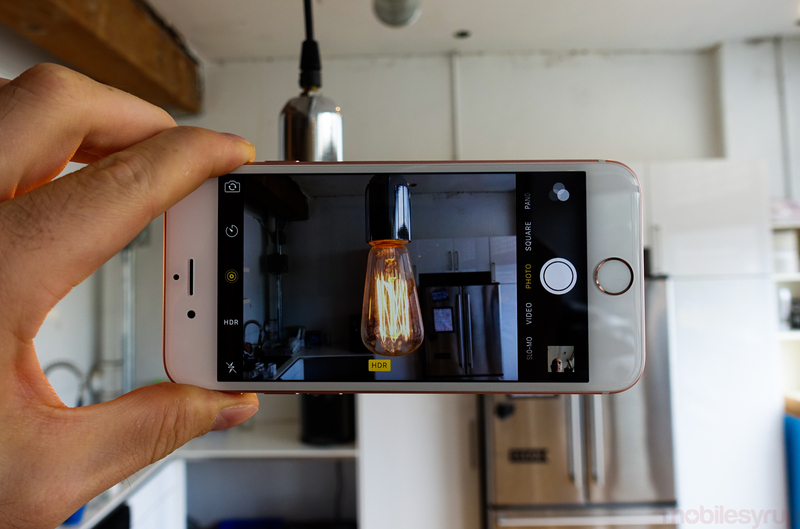 Of all the iPhone 6s’s new features, Live Photos is the most enjoyable to use, and the most rewarding to share. As a photographer, it’s also the single best reason to upgrade. Oh, and you can do this. Both new iPhones have batteries five percent smaller than those of their predecessors. In the case of the iPhone 6s, that means a reduction from 1,810mAh to 1,715mAh, and on the larger 6s Plus a change from 2,915mAh to 2,750mAh. The good news is that battery life has not reduced by a meaningful amount on either phone; the iPhone 6s still lasts most of a day with moderate use, and the Plus a day and a half to two days. But anyone hoping for an increase over last year will be disappointed. Apple’s ratings of 11 hours of video playback on the iPhone 6s, and 14 hours on the 6s Plus, appear accurate based on my video loop tests, but subjective use was more inconsistent. The iPhone 6s, inevitably more popular than its larger counterpart, doesn’t appear to have enough juice to consistently last the whole day without a short top-up. 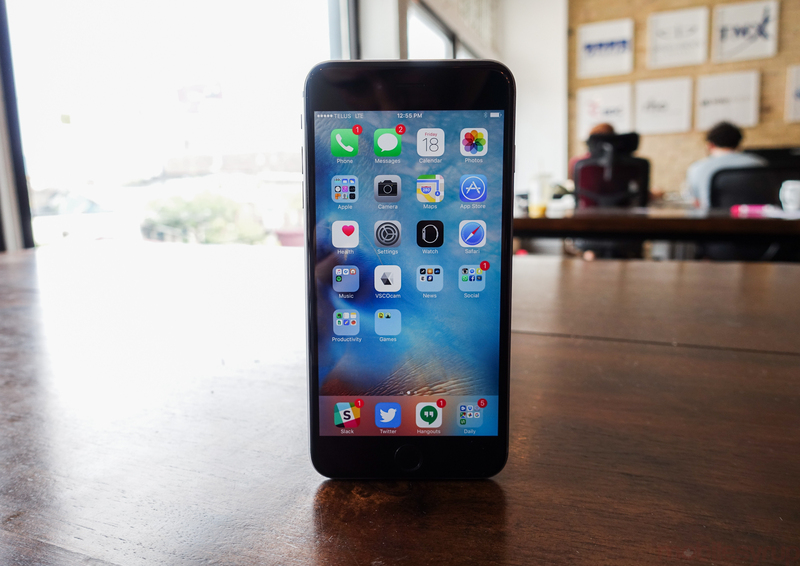 That stress will be alleviated by going with the iPhone 6s Plus, though then you’re dealing with a much larger phone. It’s easy to buy a battery pack, but that’s yet another accessory. 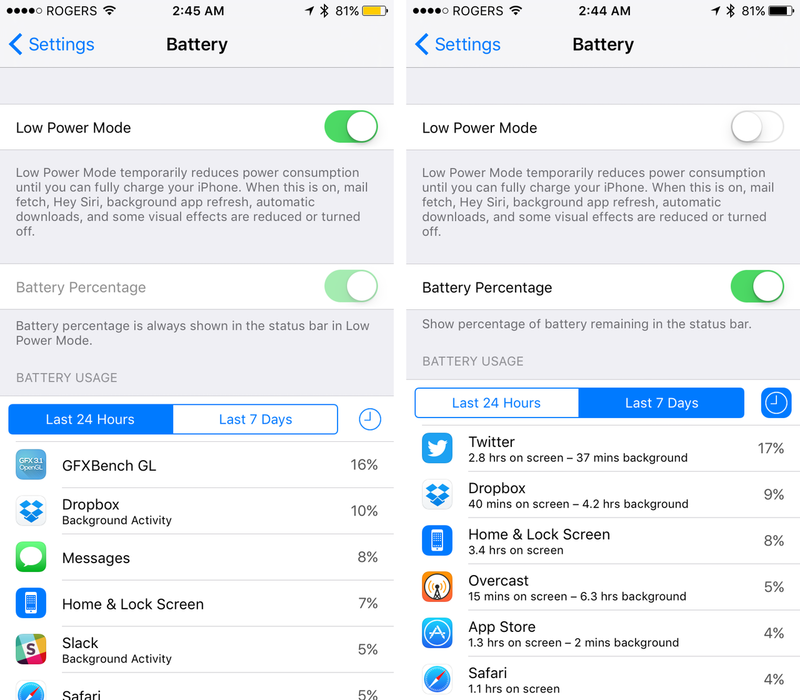 Thankfully, with iOS 9 Apple has added a Low Power Mode, cutting off background app refresh, automatic downloads, superfluous animations and automatic mail fetch to extend battery life. There is a cost to functionality in turning it on, but Low Power Mode managed to keep my under-10-percent iPhone 6s alive for two additional hours one night. Both devices can charge relatively quickly, too, but Apple continues to ship iPhones with one-amp power adapters, instead of the 2.1A versions included with iPads. Using the included adapter, it takes just over three hours to recharge the iPhone 6s, and over three and a half to charge the iPhone 6s Plus; that time is cut by over a third with an iPad adapter, which is, of course, much larger. As Apple does every year, new iPhones mean faster connectivity. This year, the iPhone 6s and 6s Plus are Category 6 LTE compatible, with theoretical download speeds topping 300 Megabits per second using carrier aggregation, double that of the iPhone 6. The phones also support additional LTE bands compared to last year, including Band 12, which Rogers is rolling out across Canada to shore up its 700Mhz spectrum offering. The new devices also support WiFi Calling and VoLTE, though so did last year’s models. 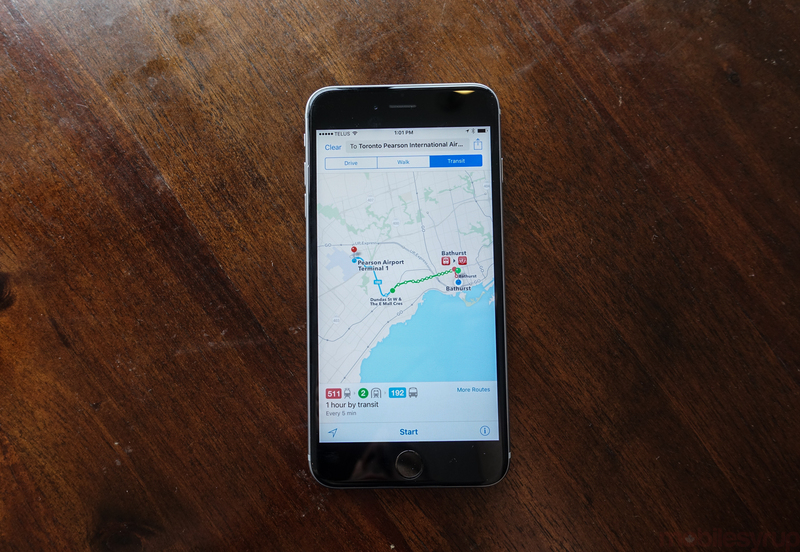 Rogers rolled out WiFi Calling to the iPhone 5c and higher alongside iOS 9, but Bell is only supporting the feature on the iPhone 6s and 6s Plus. As for VoLTE, Rogers, which has experimented with the new IMS-based protocol on some Android devices, it has committed to supporting Voice Over LTE on the new iPhones at a later time. Like all iPhones, call quality is loud and solid, though little has been improved this year in that department. The single bottom-facing speaker is, while better than many devices on the market, still relatively weak and sibilant, and can’t match the recent crop of stereo front-facing options from Motorola, HTC and others. With Apple focusing on speaker design on the iPad Pro, let’s hope Jony Ive spends some time focusing on external sound on next year’s iPhone models. 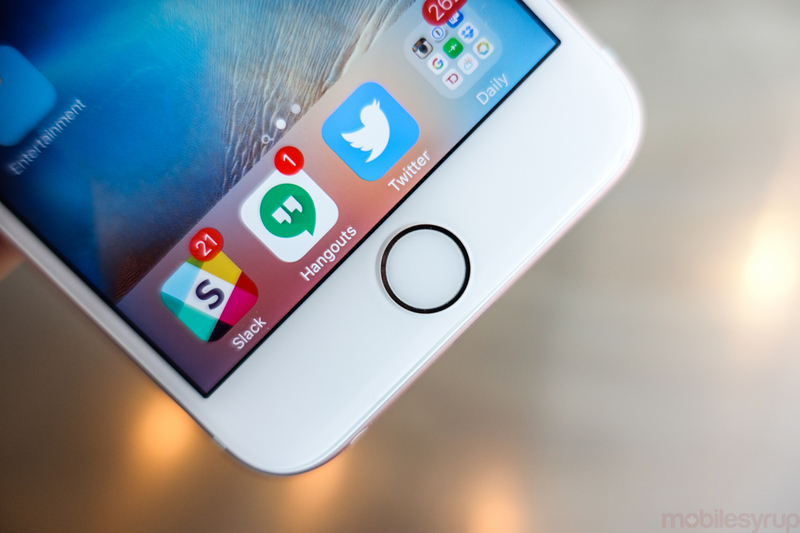 Touch ID has been doubled in speed this year. It is so fast, in fact, that I often don’t even see the lock screen before the phone unlocks; the first few times it happened I had to check to see if the fingerprint sensor was actually enabled. As a result, Touch ID is no longer a two-step process of turning on the phone and unlocking it. It now happens in one fluid motion, and with far fewer negative responses than on either the iPhone 5s or iPhone 6. 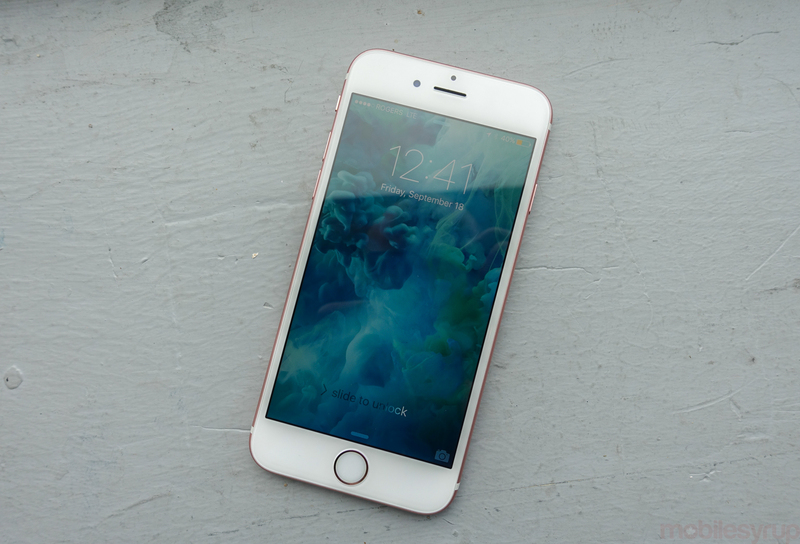 On the storage front, Apple has once again insisted on using 16GB as the base model for the iPhone 6s and 6s Plus. Despite assurances that both iOS 9 and the apps that run on it are less storage-hungry, I’d recommend spending the extra $130 CAD and buying the 64GB model. It doesn’t make sense to spend hundreds on the phone you want only to realize a year into your contract you should have opted for the higher-storage version. Unfortunately, nabbing that 64GB iPhone 6s model means spending $529 on-contract, or $1029 outright. 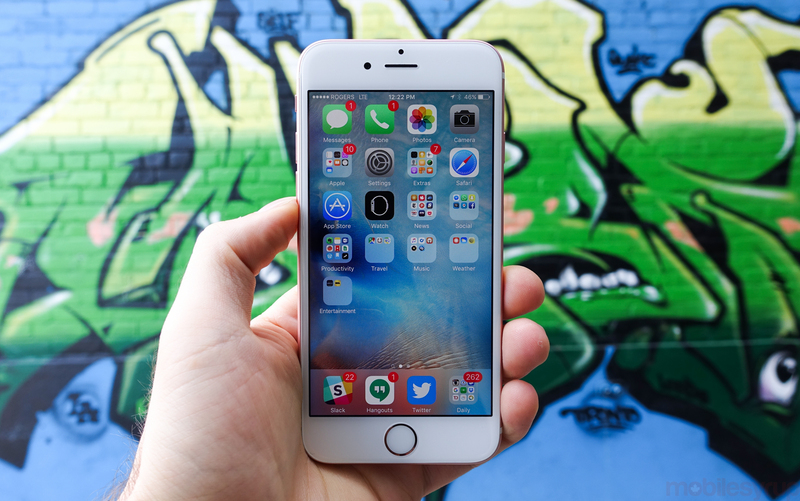 The same size of iPhone 6s Plus is an even harder-to-stomach $659 on-contract and $1159 outright. These are Apple’s best phones to date, and certainly worth the money in my opinion, but they’re coming into a Canadian market beset by a weak dollar, and without the financing options to open the door to those who wouldn’t otherwise be able to afford it. There are alternatives: Apple continues to sell the still-excellent iPhone 5s in both 16GB and 32GB versions, and the iPhone 6 and 6 Plus are relatively good deals in both 16GB and 64GB variants. To get the gold option, or the new rose gold hue, you’ll have to spring for the new iPhone 6s or 6s Plus: that’s just the way Apple wants it. The new iPhones are up against a market saturated with good smartphones. Aesthetically, Samsung’s newest Galaxy models are the closest one will find to the iPhone 6s and 6s Plus, and thanks to Samsung’s proclivity towards two release cycles a year, there are four variants to choose from. 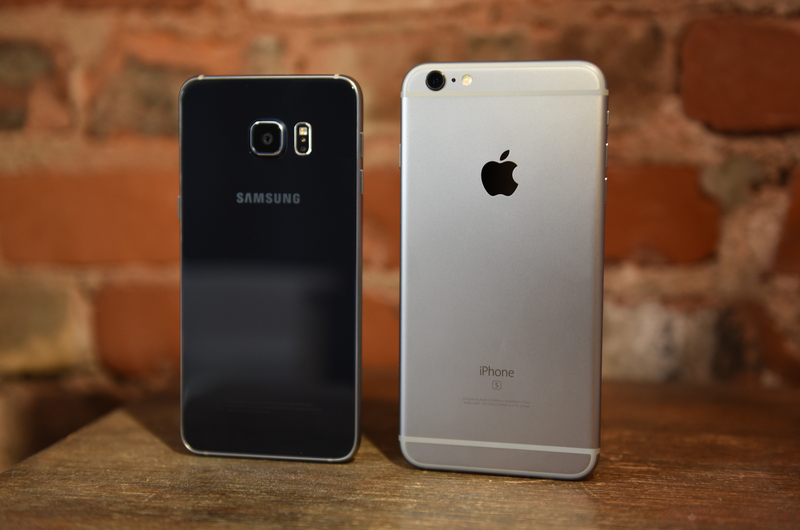 Of the Galaxy S6, S6 edge, S6 edge+ and Note 5, the S6 is probably the best alternative to the iPhone 6s, and the Note 5 to the iPhone 6s Plus. These phones come the closest to matching the iPhone in terms of speed and camera quality, but Samsung still plays it a little fast and loose with its Android skin, and the company’s software updates are often held up by the carriers, a problem Apple has avoided entirely. On the less expensive side, Motorola’s new Moto X Play is the best option for a stock Android experience, and the sub-$450 price point is sure to appease the budget-minded smartphone customer. And if you can get one, the OnePlus 2 is a good deal for a decent Android phone with a few quirks. 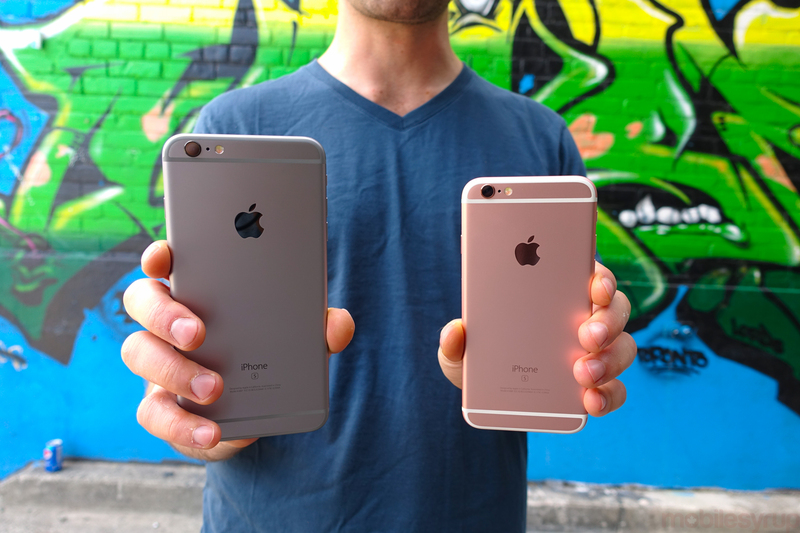 The iPhone 6s and iPhone 6s Plus are two of the best smartphones ever made, and are going to be enormous upgrades to many Canadians coming from the iPhone 5 or 5s. Despite no upgrades to battery life, a disappointing 16GB of base storage, and an inflated price due to the weak Canadian dollar, there is no reason to think demand will diminish for what is sure to be the top-selling smartphone over the next year. Tangible improvements, like the addition of 3D Touch, or the camera upgrades, are worth highlighting, but it is the sense of cohesion and thoughtfulness that continues to separate Apple from its competitors year after year.